Kochi is a nice little seaside town where were able to do some sightseeing. The next day our driver took us to a river where we actually bathed the elephants! So cute!! Sunset over the River in.. The elephants get a real thorough treatment and we even got to back scrub them with a coconut. After the bath we joined the elephants back to their resort where we could ride them around. These animals are so big all the shaking could easily throw us off any other second. 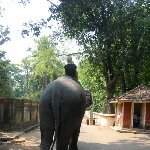 Did you enjoy Bathing the Elephants in Kochi in India and have you been on a holiday in Kochi, India? Sunset over the River in Kochi, India. The bedroom of our little Indian home. Our house in Kochi, India. Riding the elephants in Kochi. 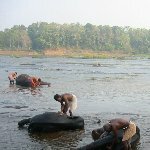 Three elephants are getting a bath in the river. Bathing the elephants in Kochi, India. Elephant ride in Cochin, India. 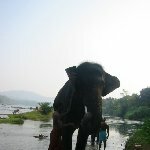 Photo of elephant in the river, Kerala. Photo of an elephant spraying water, India. Keeper and elephant taking a bath in Cochin. Elephant spa treatment in India. Washing the elephants in Kerala, India. Elehpant in the Kerala river spraying water. Elephant in India spraying water. Elephant poo in the river, India. Elephant walking to the water for its bath. Photos of a baby elephant in India. Ready for an elephant ride in Kerala. Elephant close up picture, India. Pictures of a baby elephant getting a bath in India.